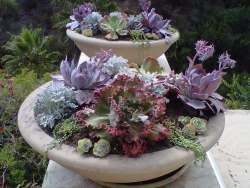 Succulents are drought tolerant, not drowning tolerant. They hate getting wet feet, so protecting them from summer downpours is important. But how do you fix it if they get soaked to the bone? That's the problem, and it takes some work to get them back on track. So, the type of pot, first. Is it glazed inside, or metal, or terracotta or hypertufa? Anything that is non-permeable, like glazed pottery, won't dry out on its own. If it's pottery without glaze, or some other material that the water can wick through, leave the plants in it, if not, remove them to dry them out. The type of soil is one of the most important factors when you want to grow succulents successfully. They hate any kind of organic matter, which as you know, will hold water in it. 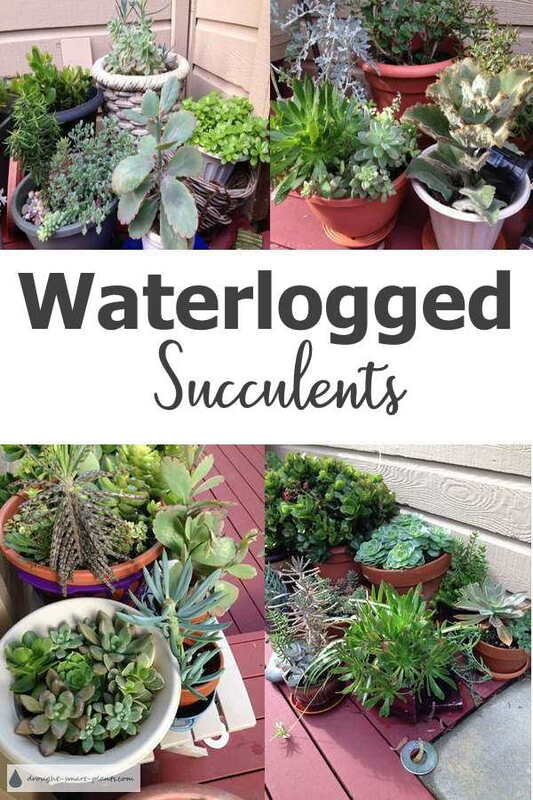 There is no substitute for good drainage with the type of soil you use for growing succulents. The temperature is also important. If the rain is cold, the soil will stay waterlogged a long time, giving the succulents even longer time to rot. Warm rain in the summer may evaporate within a day or so, which is fine. Raising the pot up off the ground gives the water a chance to percolate out of the bottom of it. Drain holes are essential - lots of pots are meant to be cache pots, holding the plant inside another pot for decorative reasons only. Too Late - the Soil is Full of Water - Now What? First emergency step - remove the plant from the pot and set it on a screen, inside a colander, or up on a block of wood or upside down pot to drain. If the soil is not filled with roots, remove any loose soil first. This will help the roots dry out faster. Then, once the main part of the moisture is gone from the root ball, inspect the roots. If they're black, brown or mushy, cut them off. Succulents can survive long periods of time without roots - but they can't survive rot. How do you tell if your plants are rotted? It may be necessary to cut almost all of the roots off - but don't worry! They can live quite happily off the reserves in the fleshy leaves. The drying out process needs to be done under cover - in a greenhouse or other bright place. Heat isn't necessary. It's been a couple of days now, is the soil almost dry? Pot the plants back into their planters with fresh dry soil. This is the best time to make sure that it's the correct type of soil. Don't water it! Let them get established first, and start making some new roots.